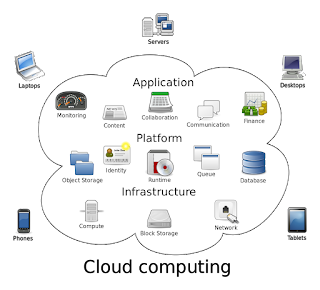 The cloud is a term referring to accessing computer, information technology (IT), and software applications through a network connection, often by accessing data centers using wide area networking (WAN) or Internet connectivity. Almost all IT resources can live in the cloud: A software program or application, a service, or an entire infrastructure. 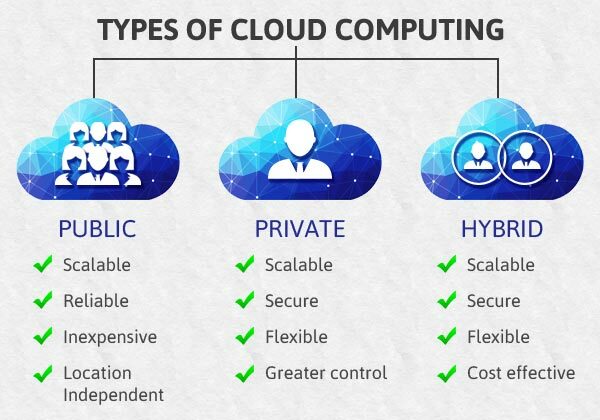 For example, if a business wanted to build an IT infrastructure, typically it would install the servers, software, and networking resources it needed, but nearly all of those services and resources are now accessible by going to third parties that offer them in the cloud "cloud drive . The concept has grown over time, to include just about any service that can be provisioned quickly via a network connection, often using the Web or mobile applications. For example, a customer could order up Web hosting in the cloud (Amazon or Rack space), or consume digital media services such as movies and music on demand in the cloud (Apple iTunes, Amazon, and Netflix), storage (Dropbox or Google Drive), email (Gmail ), or even contract for housing and transportation services (Air BNB or uber). Business software such as Microsoft Outlook, once predominately reached on local networks or computers, is migrating to applications accessible by the cloud. Cloud computing is quickly becoming the standard way for technology companies to access IT infrastructure, software and hardware resources. 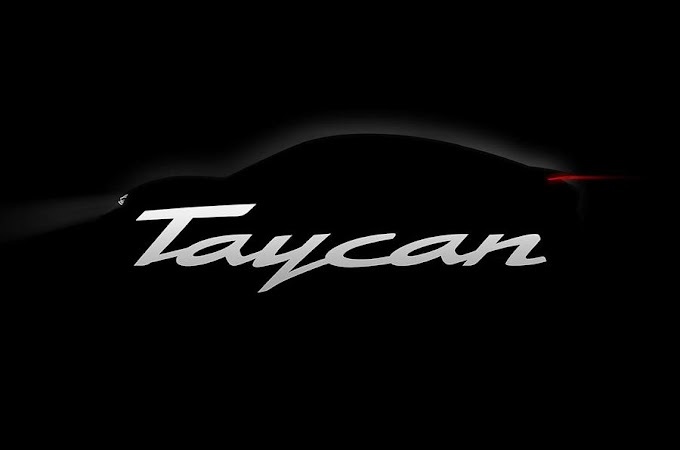 The technology enables companies to be able to use applications and other resources managed by third party companies that are stored in high-end server computers and networks. Cloud computing systems are mainly set up for business or research purposes. In this article, we explore the different types of cloud computing solutions. Cloud computing helps businesses to be more efficient and save on software and hardware that are important for different operations. 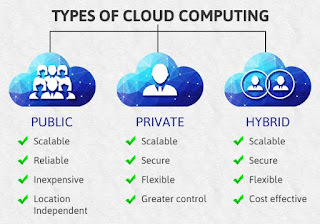 The definition of cloud computing varies depending on your source but what is generally agreed is that it involves access of software or hardware that are in the “cloud” i.e. use of software or hardware remotely. If your company is using specialized applications where you did not have to set up server or buy hardware or software to run them, then you are probably using a cloud application. IaaS is the lowest level of cloud solution and refers to cloud-based computing infrastructure as a fully-outsourced service. An IaaS provider will deliver pre-installed and configured hardware or software through a virtualized interface. What the customers accessing the cloud services do with the service is up to them. Examples of IaaS offerings are managed hosting and development environments. Your web hosting company is an IaaS provider. Some of the major players offering infrastructure as a service solution include Google, IBM, Rackspace Cloud Servers, Amazon EC2 and Verizon. This type of cloud computing is similar to IaaS but is more advanced. With PaaS, apart from simply providing infrastructure, providers also offer a computing platform and solution stack as a service.The IT infrastructure may come with a graphic user interface, run-time system libraries, programming languages or an operating system. PaaS services are mostly used by companies that need to develop, test, collaborate and deploy cloud solutions for particular applications. However, the hosting of the application is done by a third party i.e. the PaaS provider. PaaS providers offer a fully configured sandbox and deployment environment for customers to develop, test and deploy their cloud applications. Examples of PaaS solutions include Salesforce.com’s Force.com, Rackspace Cloud Sites, Google App Engine and Microsoft Azure. Community – Most of the time, many people are involved in building cloud applications in PaaS environments. This creates a strong supportive community that can help your development team along the way. No more upgrades – Companies are not required to update or upgrade the infrastructure software. Instead, the PaaS provider handles all upgrades, patches and routine software maintenance. Lower cost – Companies face lower risk since they do not have to make upfront investment in hardware and software. Simplified deployment – The development team can concentrate on developing the cloud application without having to worry about the testing and deployment infrastructure. When talking about cloud services, most people think of Software as a Service (SaaS) providers. SaaS providers provide fully functionally web-based applications on demand to customers. The applications are mainly targeted at business users and can include web conferencing, ERP, CRM, email, time management, project tracking among others. The payment models for SaaS solutions can include subscription based (Salesforce), pay-for-use (WebEx) or free. More examples of companies that offer SaaS solutions include Citrix, NetSuite, and others. According to a Gartner report, 30 percent of midsize companies will have adopted cloud recovery service by 2014. Recovery as a Service (RaaS) solutions helps companies to replace their backup, archiving, disaster recovery and business continuity solutions in a single, integrated platform. RaaS providers protect and can help companies recover entire data centers, servers (OS, applications, configuration and data), and data (files and databases). Example of companies doing RaaS are Geminare, WindStream Business and nScaled. Businesses can benefit from cloud services by improving efficiency and reducing costs. Companies can adopt cloud services based on their priorities, areas of expertise and business processes. Like is the case with an IT project, careful planning and preparation should be done before switching to cloud services. Kim poster dead # Representatives of Diddy, real name Sean Combs, confirmed the actress and model’s Kim Porter death. 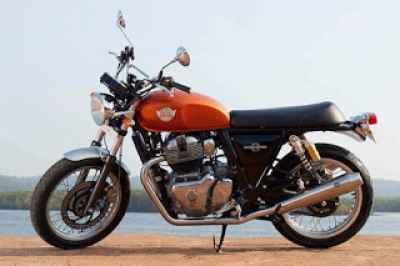 Latest Hero Karizma 2019 may get styling for youngstars.